How is your summer going so far? We are thoroughly enjoying ours and trying our best to do lots of fun outdoor activities while we can. One of those activities is spending time in our new garden! 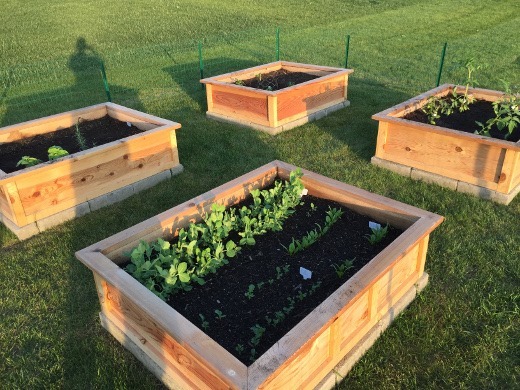 Earlier this spring I shared our our new garden, with four raised beds installed by FarmWorks in Ann Arbor. I wanted to give you guys an update! 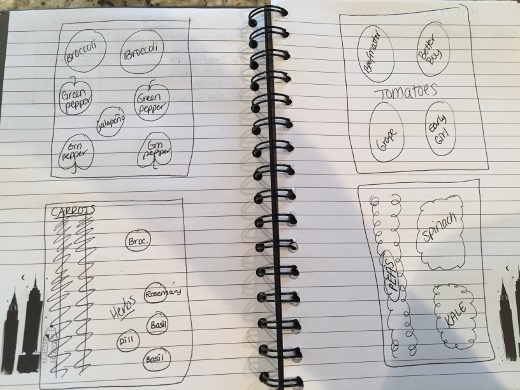 Before planting, I scribbled out a design for each box. 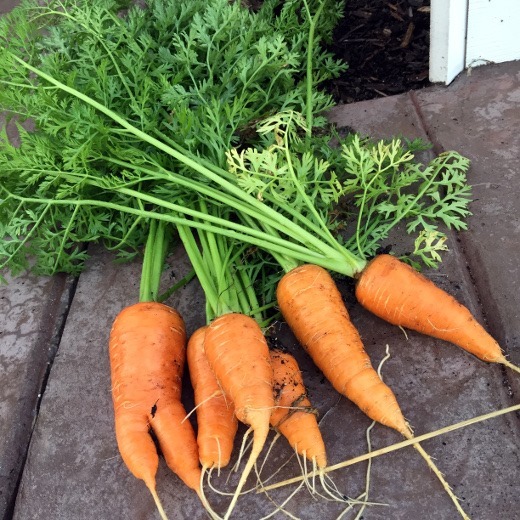 From seed I planted carrots, peas, spinach, and kale. 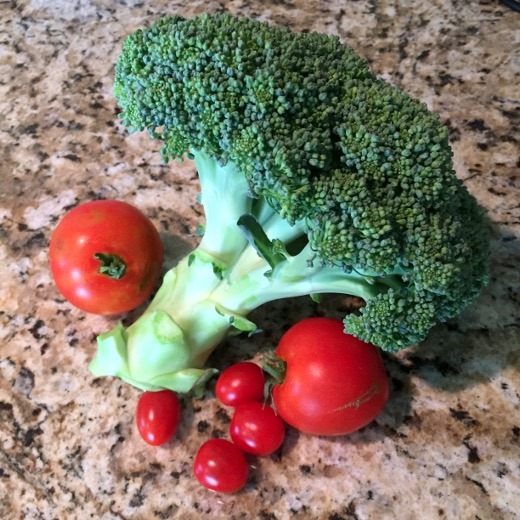 All of the other vegetables were purchased as small plants, including broccoli, several herbs, four varieties of tomatoes, green peppers, and one jalapeño plant. My plants have been thriving! With one exception – my green peppers aren’t doing much. Womp. We did have a brief aphid attack on our peas (right after we had finished harvesting all the peas, which was a relief), as well as some Japanese beetles on my basil (of all things!) which were fairly easily eliminated with soapy water. But other than that, things have been going very well. We have been picking lots of tomatoes the last couple weeks, mostly grape tomatoes and Early Girls. Still waiting on Better Boys and Beefmasters (best tomato name ever). BabyGoesNomNom (who is now almost TWO!) 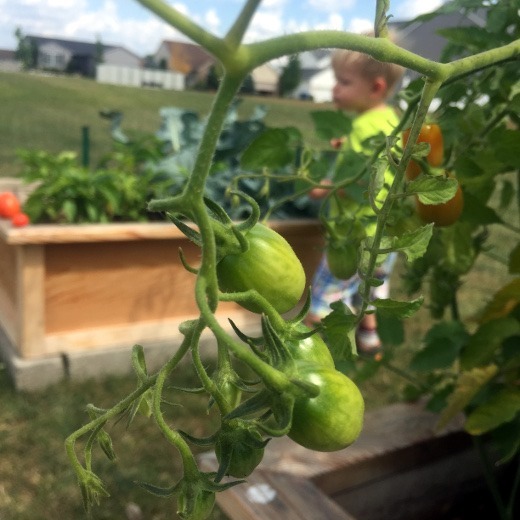 loves helping in the garden, and even more so, LOVES eating the fruits (er, veggies) of our labor. I kid you not when I say he has eaten the majority of everything we’ve grown so far. If he gets to come out into the garden and help pick the veggies, he will enthusiastically gobble up anything we pick. He ate every single pea we grew this year! He preferred the sweet and tender little peas straight from the pod, and raw. We picked all the pea pods together (he helped collect them all in a bowl) and then we came inside, cracked open the pods, and he removed the peas and ate them all! One day he started gnawing on a carrot right after we pulled it from the ground, still covered in dirt! I laughed and corrected him, we came inside and washed it, then I set him free to gnaw on it (under close supervision of course, so no choking.) He won’t really eat them cooked but loves them raw, right from the garden. I know! He will eat them right down to the green fronds. Broccoli! We all like ours roasted with olive oil, garlic salt, and pepper. 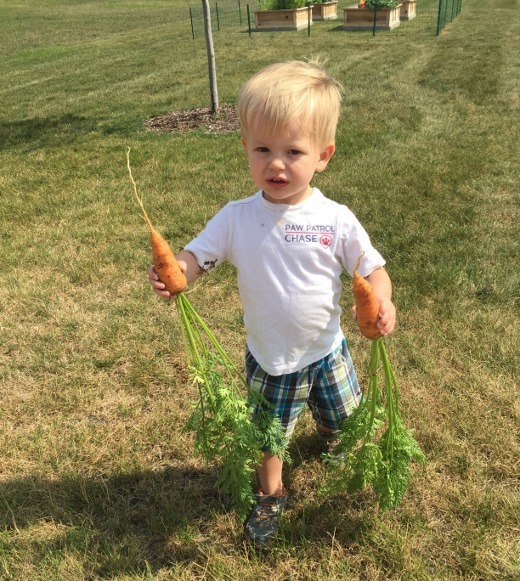 He is so proud of our harvest! Yesterday we picked all of these tomatoes. He is obsessed with the grape tomatoes though (he asks for “more red!”) , and gobbled up nearly all of them before I snapped a pic. All in all, I’m so glad I decided to start a garden this year! It’s nice and peaceful to go spend some time in the yard in the evenings after a long work day, and also fun to spend time with Jack outside. We will definitely garden again next summer. Enjoyed this post ! 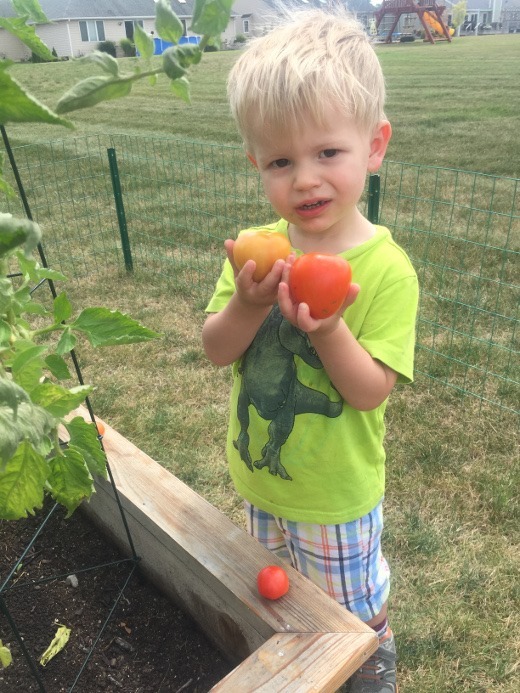 Garden looks great and glad Jack enjoys picking as well as eating all of the delicious veggies. Wow what a great garden! Jack must love it! 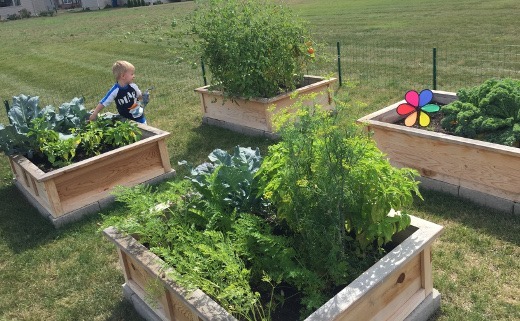 We have tomatoes, green beans and zucchini. Nothing better than a garden! That sounds great! Homegrown tomatoes are the best. 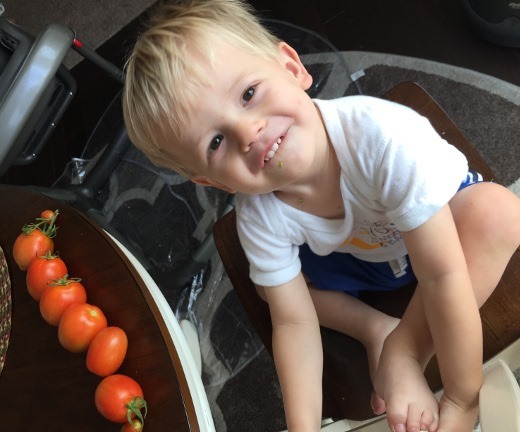 Jack gobbles up the grape tomatoes we grow. Great looking garden and vegetables to match. I am impressed and maybe the raised beds is the way to go, as the only thing I seem to be able to grow is dirt. We’ve been really pleased with them so far. We couldn’t grow anything in our yard either – it’s all clay. 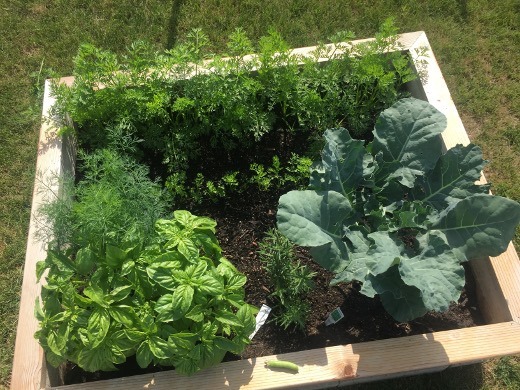 Raised beds have been great!